Embark on a journey to discover harmonious Balinese culture and plunge into an enriching family adventure together. Welcome to the perfect blend of trendy surf spot and Balinese art and soul. 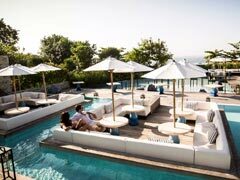 Club Med Bali beach resort invites you to a harmonious destination for the whole family. Dive into outdoor adventures like riding our world-class waves or simply uncover the beauty of local dance and colourful craft together. Rejuvenate and revitalise your body with a variety of curative experiences. 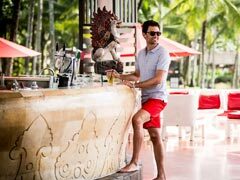 From beachside yoga and Balinese spa treatments, to the freshest seafood and the perfectly mixed libations, this is where memories are made. Dine al fresco right on the water’s edge. 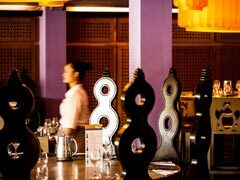 Surrounded by sparkling pools, Le Deck Gourmet Lounge welcomes you to enjoy air-conditioned indoor seating at the bar with light bites and a la carte dining at the trendy, waterfront restaurant. You can sample local flavours, fresh seafood, perfectly prepared fish, and refreshing beverages day and night. 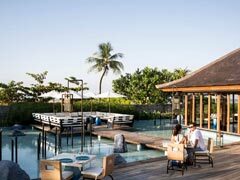 Settle into private booth seating under the outdoor deck’s crisp white umbrellas and enjoy the Bali island breeze. You can also gather to grab a late-night snack with friends and simply relax. On every floor of the Flores, Lombok, Java and Sumba buildings, with a view over the gardens. 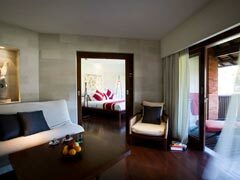 Warm wooden furnishings, gentle lighting, a comfortable bed... from this Balinese-style room, couples and families can take advantage of an exceptional view over the coconut grove. Why not opt for an Interconnecting Club Room with Terrace or Balcony? 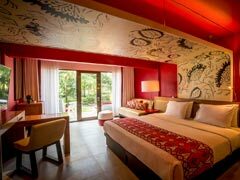 The modern Deluxe Rooms are adorned in traditional Balinese design, warm red hues, and locally-inspired fabrics. Enjoy lush garden views from the breezy terrace. 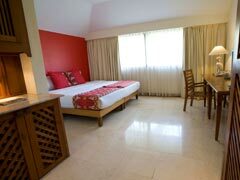 Deluxe Rooms are spacious enough for couples or small families. You’ll find conveniences such as a television and WiFi access as well as plush bathrobes for added comfort. As a Deluxe G.M., you’ll enjoy turndown service, and luggage delivered to and picked up from outside your room. Let your children live it up. At our Bali island resort, each day is what they make of it. With a variety of outdoor sports and adventures, arts and crafts, performances, and even a flying trapeze, your children will have an unforgettable time during their family holiday in Bali. Age-specific clubs: Baby Club Med (4 to 23 Months) (Extra Charge), Petit Club Med (2 to 3 years) (Extra Charge), Mini Club Med (4 to 10) (Included), Junior Club Med (11 to 17 years) (Included). Hotel amenities and facilities for kids: BABYSITTING From 4 months to 7 years (extra charge), PYJAMAS CLUB From 4 months to 7 years (extra charge), CLUB MED BABY WELCOME® (FROM BIRTH TO 23 MONTHS) Until 23 months, BABY CORNER From 4 to 23 months, PLAYGROUND. Activities for kids: PETIT CHEF PROGRAM From 4 to 10 years, PETIT CIRCUS From 4 to 5 years.